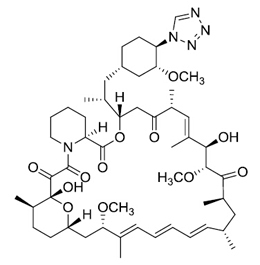 Zotarolimus, tetrazole-containing macrocyclic immunosuppressant, known as ABT-578, is a noval analogue of rapamycin (sirolimus) that was designed to have a shorter in vivo half-life than rapamycin. Zotarolimus was not genotoxic in the in vitro bacterial reverse mutation assay, the human peripheral lymphocyte chromosomal aberration assay, or the in vivo mouse micronucleus assay. Solubility Soluble in ethanol, methanol, DMF or DMSO. Limited water solubility. 1. Compositions, systems, and kits for administering zotarolimus and paclitaxel to blood vessel lumens. Burke S.E. et al. US Patent 7,357,942, 2008. 2. Zotarolimus, a novel sirolimus analogue with potent anti-proliferative activity on coronary smooth muscle cells and reduced potential for systemic immunosuppression Chen Y.W. et al. J. Cardiovasc. Pharmacol. 2007, 49, 228.